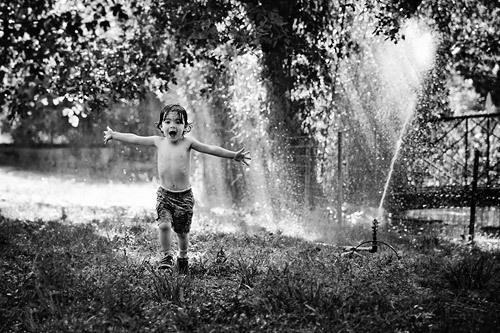 For French photographer Lisa Tichané, capturing the many joys of childhood is an obsession. For Lisa, capturing such moments is a selfish pleasure: photographing joy and carefree moments nurtures her deeply and helps her to be a happier person on a daily basis. But, beyond her personal pleasure in capturing joyful moments, she also believes that it's her duty as a family photographer. Lisa wants to create lasting memories for her clients, memories that will still be there when their kids become parents themselves. Even when she is taking pictures of a tiny baby, Lisa can't help but think about the adult he is going to be one day, and that her work will remind him and his parents of moments that would long be forgotten if pictures weren't there to tell him the story. The gift Lisa wants to create for the children she photographs is being able to remember how happy their childhoods were: the belly laughs, the adoring gaze in their parents' eyes, the crazy games they played with their siblings, the complicity and tenderness between them. These are joyful memories that the entire family will cherish for a lifetime. Unfortunately, capturing joy is not as easy as pointing a camera at them and asking them to "Say cheese!" Rather, true joy and raw happiness don't happen on command, photographers have to work hard to make them happen in front of their camera. But, once photographers see the result almost all agree that it's entirely worth the effort. Lisa sums up her philosophy this way: to get happy expressions from your subjects you need to create the conditions for joy. 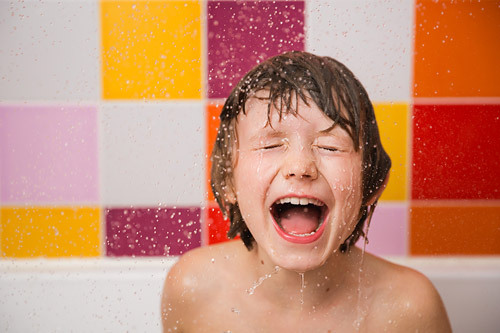 The easiest way to capture happy expressions is to make sure that the child is having fun. It may sound obvious but it is often as simple as that. 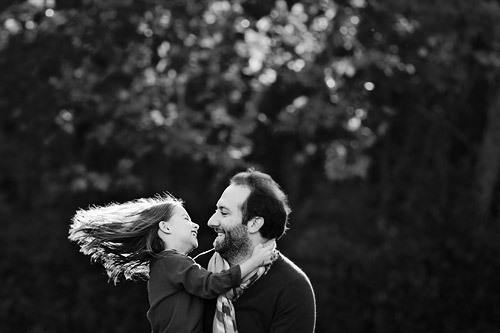 Think about your shooting time not as a moment to take photographs, but as a FUN moment for the child. What does he love the most? Eating ice cream? 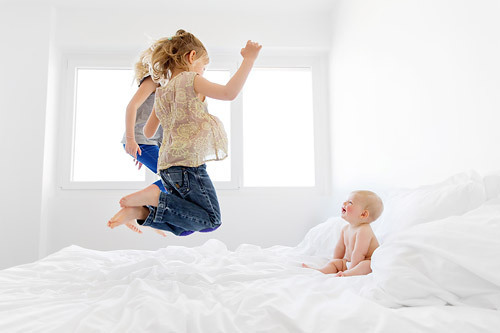 Jumping on the bed? Playing ball with Dad? Find this out, and you've got a plan for capturing joy. Do everything you can to create a pleasing situation for the child and you will get tons of happy expressions without any further effort. Don't forget that your own attitude will set the mood. If you get nervous or frustrated because the child is not following directions, it's very unlikely that you'll get them to smile happily for you. On the other hand, if YOU are having genuine fun (not just for kids!) your own laughter will be infectious and your subjects will follow your lead without effort. 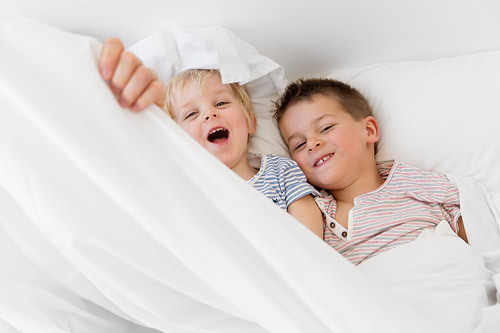 Find an activity that will also make YOU and the parents smile to make sure that you are oozing joy! Adapt the location of the shoot to the child: a shy kid might loosen up more easily in his own backyard, while a very energetic kid will give you the widest smiles if you let him run in an empty field or jump freely on a trampoline. You don't need to find complicated or fancy ideas to make it work. 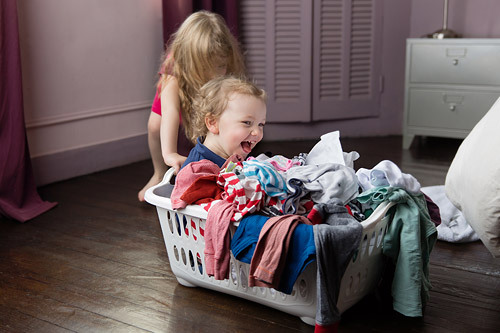 A child's own house is full of fun opportunities: hiding under the sheet, playing in a bath filled with bubbles, wrestling on the couch or playing with the laundry basket are just a few of the many irresistible activities you can find in anyone's home home. 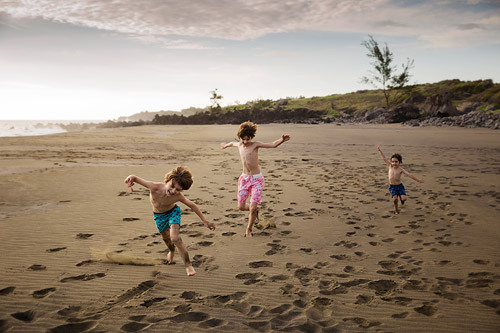 Movement helps your subject forget about the camera, loosens tension and releases endorphins, which are great assets when you want to capture happiness. This method works perfectly with children : ask a very shy kid to run really fast for you and you will suddenly get bright eyes and proud smiles. You will also get fabulous results if you let children be silly: make them sing, shout, listen to music really loud and dance to their heart's content...There is nothing like being wild to help unleash positive emotions! The good news is that movement is also a wonderful tool with adults. If Dad is grumpy and doesn't want to be in the picture, simply ask him to lift his baby in the air or make his daughter swirl and his expression will suddenly relax and probably become (oh, surprise!) genuinely joyful. Sometimes, having someone to help you out during the session can be invaluable. Another adult, a parent, or an older sibling all work. Joyful expressions often last a fraction of a second, so you need to be fully concentrated behind the camera to catch them. It is not easy to tickle a child while taking the shot and still get a sharp, well composed image. If someone else is tickling the child for you, it's suddenly easier to get the perfect shot. 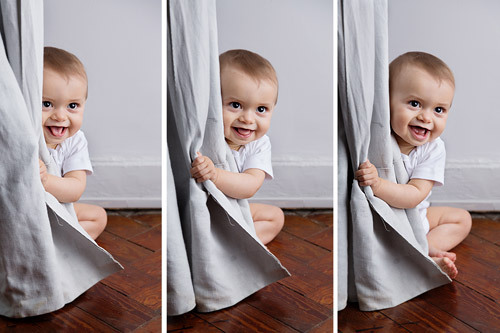 These tips work equally well for parents wanting capture their own children's joy and for photographers who want to create joyful images for their clients. For anyone who wants to learn more about Lisa's technicque, her class Capturing Joy and her e-book Photographing Toddlers are both full of useful information on how to get your youngest subjects to cooperate and capture them in their happiest moments. All photos Lisa Tichané and used with permission.